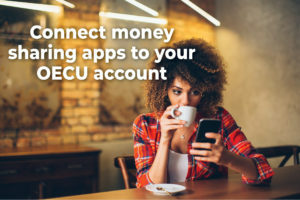 D id you know that you can connect your OECU account to online payment apps such as Cash App, Venmo, and PayPal? It’s super easy and only takes a few minutes. Below are instructions on how you can get started! To begin this process, you will want to open the secondary financial app, like Venmo, and access your account settings. From there you will be able to add either a bank account or a card. To connect your OECU online banking account you need some information first. You will need your account number and routing number for the account you want connected to the outside app. Your account number is available through our online banking portal and can also be found on any of your OECU checks or your account membership card. To access your routing number, locate it on you OECU check or contact your local OECU branch and they can give you the number. To connect an OECU Visa® card you will need to add your 16-digit card number, expiration date, and the 3-digit CSV number. After all the required information is entered, you will see three transactions on your account within a couple of days, depending on the app. You will see two deposits and one withdrawal. You will need to verify the amounts with the apps. Once it is all verified, your account/card will be linked and you can transfer money using your desired application!